The Somchai Neelapaijit Memorial Fund, Justice for Peace Foundation, Towards Ecological Recovery and Regional Alliances (TERRA), and Amnesty International Thailand will host a panel discussion entitled “Human Rights in ASEAN: Lessons Learned from the Disappearance of Sombath Somphone and Somchai Neelapaijit.” The event will take place on March 27, 2013, from 9.30-12.00, at the Jitti Tingsapat Meeting Room, 1st Floor, Faculty of Law, Thammasat University (Tha Phrachan Campus). Panelists will include: 1) Angkhana Neelapaijit, wife of Somchai Neelapaijit, 2) Dr. Sriprapha Petcharamesree, Mahidol University and the previous Thai representative of ASEAN Intergovernmental Commission on Human Rights (AICHR) and, 3) Witoon Permpongsacharoen, Director of Mekong Energy and Ecology Network (MEE Net). A statement by Somphone’s wife Ng Shui Meng will also be read during the event. The objective of the panel discussion is to raise awareness about human rights violations in the region including enforced disappearances, the two cases themselves, and to commemorate the ninth anniversary of the disappearance of Somchai Neelapaijit. Moreover, organizers want to send a message to ASEAN governments that they should not focus only on economic cooperation while ignoring human rights violations. The cases of Sombath Somphone, the Lao development worker and Somchai Neelapaijit, the Thai activist lawyer, are two prominent cases showing the failure of the rule of law, transparency and accountability in ASEAN. 15 March 2013 marks 3 month anniversary of the enforced disappearance of Sombath Somphone or “uncle Bath” of many young people in Laos, Mekong region and ASEAN. The respected Ramon Magsaysay award winner had dedicated his life to rural development and supporting youth groups by giving them the opportunity to learn. Beloved, respectful, kind-hearted and humble, Sombath is their role model as to his love for the world. The sharing and caring that Sombath shared with the young people was a part of the foundation of the growth of their own. It has now been 3 months of unexplained disappearance of Sombath which occurred on 15 December 2012, despite the CCTV clip showing once and for all his being taken by a group of men after being stopped by a street police at a point on Tha-dua road in Vientiane municipality as evening fell. Seemingly, the answer to his fortune is in the wind. We, Thai and Mekong Youth network, once again question this suspicious disappearance and request the Laos government to address it and, soon, bring him back to his family and us. We believe that, to end this human rights violation is to return peace to the Mekong region. We echo voices of the region’s people who call for sustainable development, harmony and peace. On 15th day of every month from now, we will take action to remind ourselves as well as society of uncle Bath’s enforced disappearance. Wherever he is, we feel he is still with us and we will not keep quiet about him. We shall continue to work for the good of others, serving community and society of Mekong and ASEAN. We, the youth, will always connect our actions to empower the powerless. Our ideology, way of thinking, dream and spirit of love for peace will go on. And truth will prevail. We believe that peace has now grown in us. We will help each other to make it grow larger and stronger not only for the good of us but those of the coming generations. 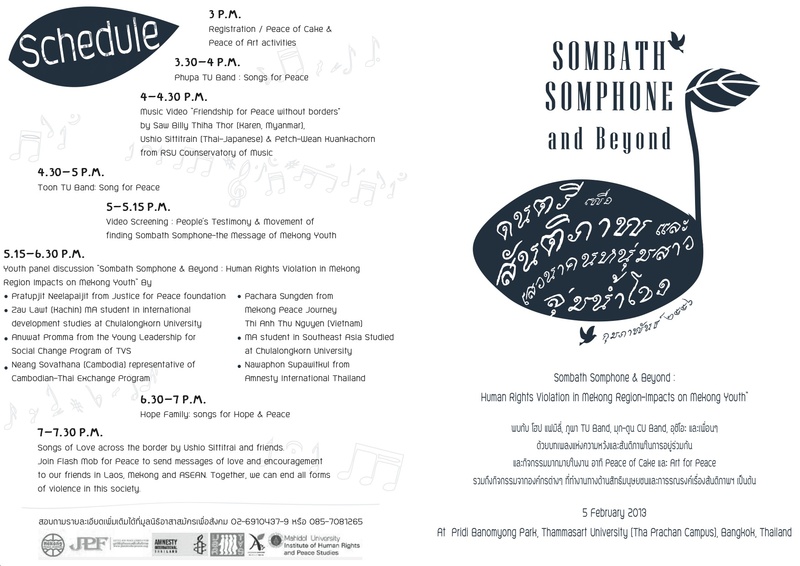 “Sombath Somphone and Beyond” Project set out of our 5th February concert for peace in Thammasart University. This “Tea Talk” is the second episode. Its key objective is to create space to discuss about peace in the young people’s perspectives. Talk over tea is symbolic in our culture, when people exchange socio-political ideas. As for 15th March in front of the Laos Embassy, we will share with our guests nice tea and cakes, together with music and performance titled “Three Nots” (not know, not see, not understand or “Boh huu, Boh hen, Boh jak” in Laos language). We will invite the Laos ambassador to join us for the Tea Talk and will in the end submit our petition that urge investigation on Sombath case. We hope our friends, colleagues and concerned others will join us so that our attempt to stop human rights violation and our search for peace shall once again be realized. It has been a month and a half since December 15, 2012 when Sombath Somphone, a renowned Laos civil society leader went missing. Even with an important evident from street’s CCTV where Sombath was last seen in Vientiane, the Laos capital showing that he was stopped by the traffic police and being taken by a group of men, there is still no clear explanation of what really happened to him and where he is. The whole world keeps asking the same question, “Where is Sombath?” to the Laos government and the movement to ask for the safe return of Sombath has become the global action. Sombath Somphone has been one of the key supporters to youth network, both in Laos and Mekong region. 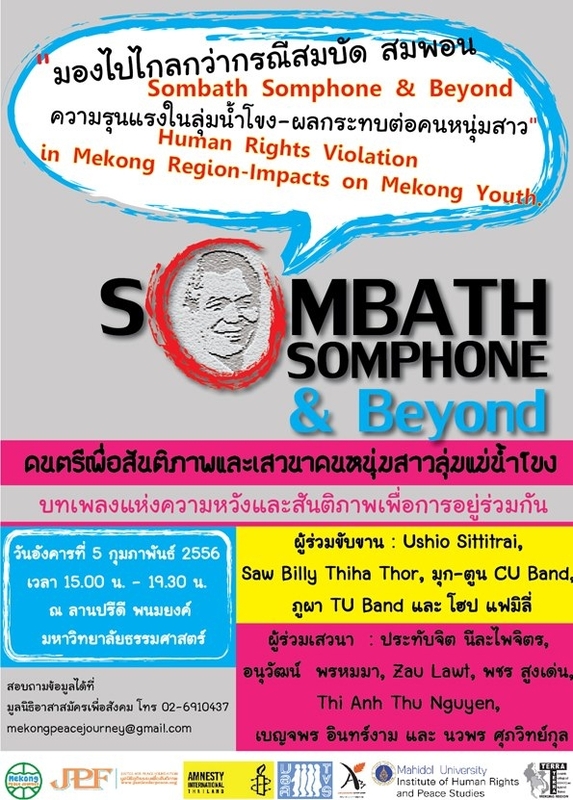 The human Rights violation to Sombath is therefore consider a major destructive matter that weakens not only the human rights standard of Mekong and ASEAN region, but also the future of youth movement. Yet, the similar human rights violation has still going on in the Mekong region. According to a report of Justice for Peace Foundation, there are more than 200 citizens went missing in relate to the conflict in three southern provinces of Thailand.With and without the report to the eye of public, such violation also going on in other Mekong countries in China, Burma, Laos, Cambodia and Vietnam in different forms. The youth network believe that such violation to basic human’s right and humanity of people in our countries should be ended, and believe that everyone, especially the young generation, should take part in questioning and bringing significant change to create a more peaceful society for our better future. 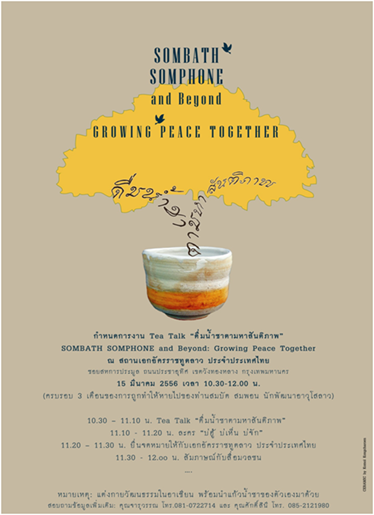 On February 5, 2013, Thailand’s youth groups, NGOs and academic alliances, together with Mekong youth network will co-organize the Music for Peace and Mekong Youth Discussion under title “Sombath Somphone& Beyond: Human Rights Violation in the Mekong Region and Its Impacts on Mekong Youth” in Thammasart University (main campus). This event, combining between the youth discussion, music and exhibition by numbers of professional musicians and representative from Mekong youths,aims to bring the message of peace, love, and harmony among Mekong countries to the citizens of the region and to invigorate young Mekong peace-builders. The event also aims to collect the sign-on petition and messages that will be pass on to relevant groups for Sombath’s safely return. Let us work together to encourage our advocates, young and experienced, to overcome such fear and violence and create a real peaceful society for all. The video of Sulak Sivaraksa talking about the disappearance of his friend Sombath Somphone is now available with Lao subtitles. Please share this with all your Lao friends. Roundtable Discussion: What does Sombath Somphone’s abduction signal to ASEAN? Sulak Sivaraksa, a leading figure in the International Network of Engaged Buddhists, talks about the disappearance of his friend Sombath Somphone, during a panel discussion at the Foreign Correspondence Club of Thailand, 21 Dec 2012. This longer video is also worth watching, with key points from the discussion at FCCT. Speakers include Sulak Sivaraksa, Kraisak Choonhavan, Somchai Homlaor, Supalak Ganjanakhundee and Premrudee Daoroung.